The African Export-Import Bank (Afrexim Bank) has signed several deals with different African investors at the 24th Afrexim Bank Annual General Meeting (AGM) of Shareholders taking place in Kigali, Rwanda. The bank signed a $100 million credit facility deal with the Executive Chairman, Heirs Holdings, Tony Elumelu. It also signed a $1billion deal with Africa’s richest man, founder and chairman of Dangote Group, Aliko Dangote. 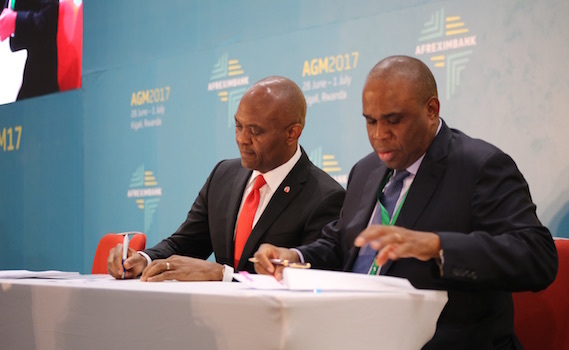 “This is important for the development of our continent and it is the way to promote the economic development in our continent, “ Tony Elumelu said. The deal with Heirs Holdings is expected to help boost Heirs holding’s activities across Africa especially in the area of real estate and hospitality. Although the details of the deal between Dangote and Afrexim were not made public, there are indications that the deal was meant for the Dangote Cement, which is increasingly expanding across Africa. People familiar with the Afrexim Bank’s activities revealed that this deal, which is expected help boost intra-African trade, is the first of its kind signed by Afrexim Bank and a private organisation. This comes a year after Dangote acquired equity in Afrexim Bank in order to promote intra-African trade. It would be recalled also that last year, The President and Board Chairperson of Afrexim Bank, Dr Benedict Oramah said that working with the Dangote Group will build a supply chain financing across Africa that could reach $1 billion in the short term. He also explained that this would promote intra-regional trade, growth of SMEs and creating much needed jobs.